A designated formula for Athletes-professionals and amateurs. Containing 40 natural ingredients in one tablet, which include vitamins and minerals, amino acids, digestive enzymes, therapeutic herbal extracts and a unique blend of antioxidants, for high-level protection from oxidation damages. For sportsmen- professional and amateur. For preventing nutritional deficiencies due to inadequate nutrition, stress, sport, or strenuous physical labor. Daily taking of Alpha Sport will prevent nutritional deficiencies due to strenuous physical activity and will support the proper functioning of the body's systems, including the immune system. 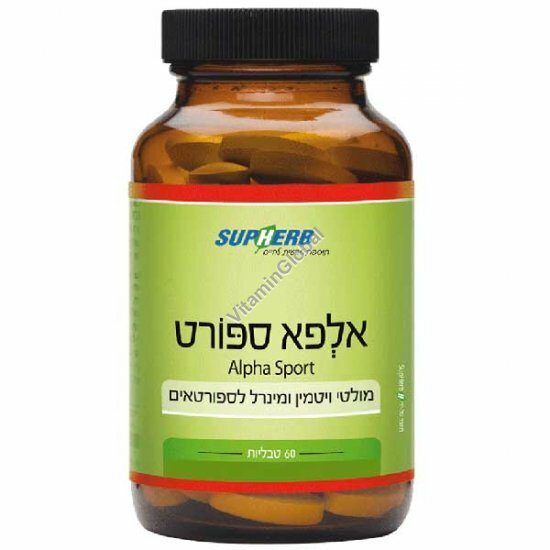 For optimal effectiveness of the formula, consuming two Alpha Sport tablets continuously and for a long period of time is recommended. Amino acids serve as the building blocks of the muscle tissue and their regular supply is essential for building the muscle and maintaining its mass. For improving energy production processes in the body, slowing the aging process, for improving athletic performance and for improving blood flow to the various organs of the body. An addition of all the vitamins and minerals to the daily diet for preventing nutritional deficiencies. A combination of therapeutic herbal extracts which help the body cope with diseases, and mental and physical conditions of stress. Directions : 2 tablets a day, with the meal.